. Temples of Japan - LIST . CLICK for more of his paintings. 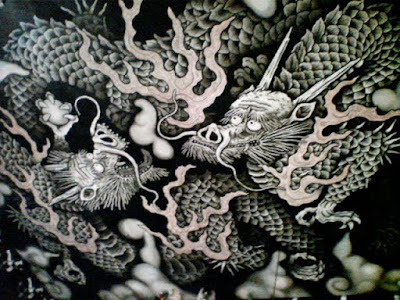 Artist Junsaku Koizumi, who painted 40 paper screens of Todaiji, the renowned Buddhist temple in Nara Prefecture, died Monday of pneumonia at a hospital in Yokohama, his family said. Koizumi studied under the famed Kyujin Yamamoto (1900-1986) while attending Tokyo School of Fine Arts, which later became Tokyo University of the Arts. He won his first award at a 1954 exhibition of new paintings. After he turned 40, he tended to stay away from painters' circles and was sometimes described as a noble loner. He produced many ink paintings of magnificent and serene landscapes. 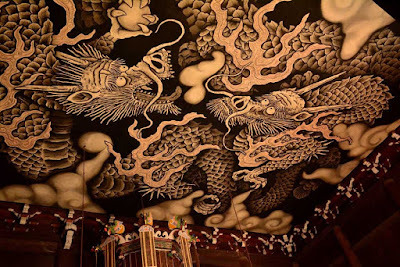 Koizumi's representative works include ceiling paintings at Kenchoji Temple in his native Kamakura, Kanagawa Prefecture, and at Kenninji Temple in Kyoto Prefecture. In 2010, he completed the 40 paper screens at Todaiji, a World Heritage site. He also created calligraphy work and pottery. Koizumi Junsaku (小泉淳作) was born in Kamakura in 1924. He was conscripted into the Imperial Japanese Military in 1943, shortly after he began his undergraduate studies in the Nihonga section at Geidai (Tokyo Fine Arts University), but contracted tuberculosis at military academy, and was dismissed from service. Koizumi did not return to school, however, until 1948, when he began studying under accomplished Nihonga painter Yamamoto Kyûjin, graduating in 1952.
is a historic Zen Buddhist temple in Higashiyama, Kyoto, Japan, near Gion, at the end of Hanami Lane. It is considered to be one of the so-called Kyoto Gozan or "five most important Zen temples of Kyoto". The monk Eisai, credited with introducing Zen to Japan, served as Kennin-ji's founding abbot and is buried on the temple grounds. For its first years the temple combined Zen, Tendai, and Shingon practices, but it became a purely Zen institution under the eleventh abbot, Lanxi Daolong (蘭渓道隆 Rankei Dōryū) (1213–1278).
. Kennin-Ji Kaisan Ki 建仁寺開山忌 . Eisai Zenji 栄西禅師　(1141-1215), a Japanese monk, founded the Rinzai school of Zen Buddhism after studying with the T'ien-T'ai school in China. He is also with credited with bringing tea from China and thereafter initiating the Japanese Tea Ceremony.